Can Lifestreaming and Aggregation Go Mainstream? Once again, Louis Gray has spun up a good conversation in the blogosphere, this time with a post focused on the magic of getting services that aggregate lifestreams to catch on as activity centers. Mashable’s Mark “Rizzn” Hopkins joins the fray, pointing out that at this stage, these services seem to fare much better with the early adopter crowd than with mainstream users. I think there is an interesting question in all of this, “Can lifestreaming and aggregation go maintstream?” After all, as Alexander van Elsas points out, based on his research, the vast majority of content aggregated by FriendFeed is “tweets” (a word unknown to the vast majority of Internet users at this moment). I’m pretty confident that aggregation is here to stay, and that the concepts of lifestreaming and aggregation will become core elements of the mainstream Web experience. But, for that to happen, we will need to see quite a number of pain points addressed, something I’ve written about recently. Right now, there’s way to much friction in the Social Web. Each site I join asks me to create a username/password pair, enter my profile data, import my address book, and manually stitch together (again) my local piece of the “social graph.” And each aggregator asks me to tell it all the services I use (my blog URL, my Twitter username, where I share photos, etc.). 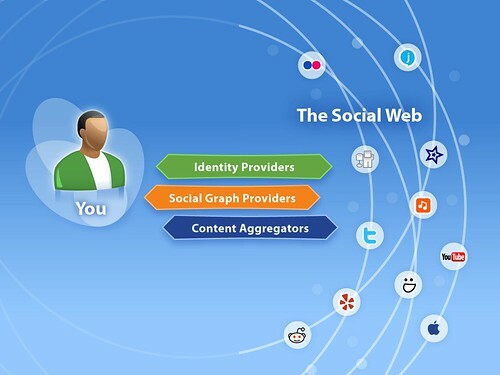 The result will be a virutous cycle of social discovery of new sites through seemless interoperability with the aggregator services. This won’t happen overnight, but it is what we’re totally focused on at Plaxo, and it’s a really exciting opportunity. 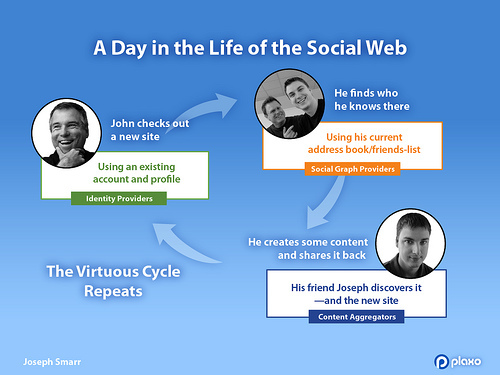 Thanks to Joseph Smarr at Plaxo for these slides from his recent talk at Web 2.0 Expo. I like the story you tell…then what is goofy2, you probably have to create a new name for it..